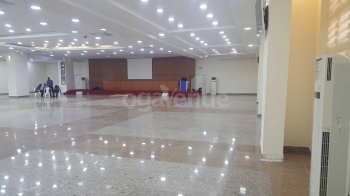 The Admiralty Conference Centre is a classy and charming multipurpose hall to behold, it sits up to 800 guests banquet settings and 1000 guests theatre settings, You get to start enjoying this centre's services starting from its very colossal car park that it provides for guests as they come in their numbers. The very well air conditioned hall has comfortable chairs and tables suitable for all kinds of events. Alongside, it has a red rug stage, lighten system, television system, a projector system, all to suit your event and give it style. There are also sterile and clean rest rooms which are also fully air conditioned. This means that guests doesn't necessarily need to leave the comfort rendered by the hall just to ease themselves. There's also a well kept changing room as well as stationed security personnels. All these are found in the Admiralty Conference Centre. Victoria Island (VI) where the Admiralty Conference Centre is situated is an affluent area that encompasses a former island of the same name that sits between Lagos Island and the Lekki Peninsula in the Lagos Lagoon. This tells nothing less than the serene environment where the Admiralty Conference Centre is located. The terms and conditions of use given applies to all services ogaVenue.com.ng offers, both directly and indirectly. 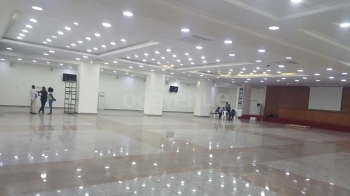 The Services provided by ogaVenue (the Services) are not limited to the Services that allows an individual or corporate body search and book for event venues. It is also worthy of note that cash payment for any of the venues booked on ogaVenue are non-refundable 3months to the event date. It is also important to take into cognizance that the terms and conditions given can be reviewed without prior notice. Payment method (40% deposit to book date and balance at least 4weeks to event date, or use Savingz by ogaVenue to pay only 15% now)br In order to see the amount applicable to your event date, complete the price form. 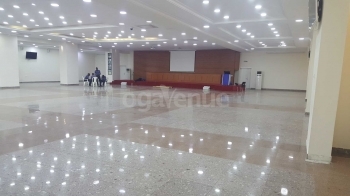 It is important to note that for an individual or corporate body to book a venue on ogaVenue is free, it is only paying for the hall that is required. Q: What type of chairs does Admiralty Conference Centre provide? Q: What type of tables does Admiralty Conference Centre Provide? Q: Is there parking space at Admiralty Conference Centre? Q: Does Admiralty Conference Centre provide power? Q: Does Admiralty Conference Centre have Restrooms? Q: Does Admiralty Conference Centre have Changing room? Q: Does Admiralty Conference Centre allow external Decorator? Q: Does Admiralty Conference Centre have a stage? Q: Does Admiralty Conference Centre have Chandelier? Q: Does Admiralty Conference Centre have Drappings? Q: What type of flooring does Admiralty Conference Centre have? Q: Does Admiralty Conference Centre allow you bring in your food and drink? Q: Does Admiralty Conference Centre provide security? Q: Does Admiralty Conference Centre provide projector? There are no reviews for Admiralty Conference Centre yet. Sorry, not available at Admiralty Conference Centre. Kindly check out other available dates or check out other venues in Victoria Island that match your requirements.